The spleen is the organ located above the stomach and under the ribs, which is responsible for fighting infection and balancing the fluids in the body. Spleen problems range from mild to severe and life-threatening. 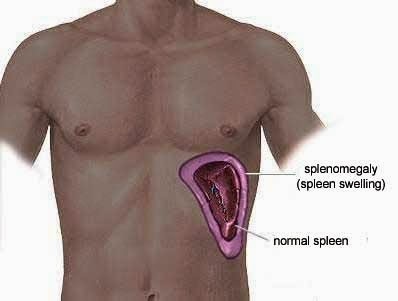 One of the most common spleen-related problems is splenomegaly, or an enlarged spleen --- may be caused by numerous factors, states MayoClinic.com, including mononucleosis, bacterial infections, malaria, liver cirrhosis, destruction of red blood cells or hemolytic anemia, blood cancers, pressure on your spleen veins and certain metabolic disorders. In some cases, people with an enlarged spleen may experience no or few symptoms, although other people with this condition may experience abdominal pain or fullness, fatigue and anemia. According to MerckManuals.com, an enlarged spleen is indicative of an underlying health problem, such as infection, anemia or cancer. If you are considering using herbs to help treat your spleen problems, first review the risks, benefits and limitations associated with herbs with your family doctor. Several natural home remedies support spleen health and alleviate general health conditions associated with the spleen. Drinking 3 glasses of Camel milk thrice a day for 3 months regularly is the most effective and natural way to cure enlarged spleen without any side effects. Put dried or fresh Figs in pure Vinegar and preserve for one week. Take 3 figs after each meal. This is a highly beneficial and trial prescription for enlarged spleen problem. Mix 3 gm Jambul (Jamun) vinegar and 3 gm pure Honey and consume for few days. This is one dose. It is highly beneficial in dealing with enlarged spleen problem. Mix 10 gm pure Honey in 2 oz fresh, pulpy and ripe Mango juice drinks daily for 3 weeks regularly. Enlargement of spleen problem will be eliminated. Due to damage of spleen, it enlarges and stomach bulges. Boil 20 gm Red Silk-Cotton (Bombax Melabarcium) flowers in ¼ litre water for 5 min. Remove from stove and keep it soaking throughout the night. Early in the morning filter the mixture. Add 3 pinch Mustard powder and drink it daily. This is a successful natural treatment for enlarged spleen problem. Mix well 10 gm lemon juice and 10 gm onion juice early in the morning. This natural remedy is highly effective for treating enlarged spleen problem. Peel and cut unripe Papaya (Papita) into small pieces as required, put in Vinegar and preserve. Take 6 of these pieces and sprinkle some salt over them now have in the morning. Fresh unripe Papaya with salt may also be taken. This treatment will provide relief from chronic enlarged spleen problem completely. Make a fine powder of Crystallized salt petre (Kalmi Shora), Split the ripe Banana with a knife and insert the powder. Take as such twice daily. This is a highly beneficial and trial treatment for enlarged spleen problem. Make a fine powder of 12 gm roasted Borax and 25 gm Mustard seeds, combine and store take 1 gm along with water twice a day. It is a most effective & magical remedy to cure enlarged spleen problem completely. Immerse 50 gm Carom seeds in 50 gm Pulp of Aloe Vera and leave it to dry under shade. Then juice gets absorbed into Carom seeds. Repeat the process for 3 days. After completely drying make powder and store. Take 2 gm before one hour of taking food for 40 days twice daily. All spleen problems will be cleared, indigestion, tastelessness, impurities stored in spleen and stomach are cleared. Cut one Radish into small pieces, sprinkle Aluminum chloride (naushadar) over it and expose to dew fall at night. Next morning have on an empty stomach. This is a 99% trial and natural treatment of enlarged spleen problem. Make a small cut on the Aloe Vera leaf, fill it with Aluminum chloride (naushadar) and suspend it with string. Place a vessel below to collect the dripping. Add 10 drops in 60 ml. of water and take thrice a day. This is a highly beneficial and trial treatise for enlarged spleen problem. Take one whole lime (or lemon your choice) and add ½ tsp baking soda until the fizz stops and then add purified water to ½ glass and drinks. This will lower the body's infections and reduce free radicals metals at the same time. This will reduce the spleen load and help its conditions. Blackstrap molasses is a byproduct of the sugar refining process that contains a wide range of healthful substances. This molasses is nutrient dense syrup that contains vitamins and minerals such as calcium, magnesium, potassium and a range of antioxidants. Taken (1 TBLS) daily, this substance helps restore and maintain the health of the spleen and the entire lymphatic system. Make a fine powder each of 6 gm Damask rose/ Rose of Castile, (Gul-e-Surkh) and Radish seeds. Mix with 12 ml. Vinegar and 12 ml. Rose oil and 6 gm Aloe vera gel to make a paste. Spread the paste on piece of cloth and apply on the splenic region. This is a fastest natural remedy to cure enlarged spleen problem. Grind Figs (Anjeer) with Vinegar to make a paste. Spread the paste on a piece of a cloth and apply on the splenic region. This is another instant and effective natural remedy to get rid of enlarged spleen problem. To make a radish pickle cut Radishes into small pieces as required, put in Grapes Vinegar and add some salt to preserve. Have this pickle along with meals 2-3 weeks. It is another natural and ideal for treatment enlarged spleen problem. Take food before 7 p.m. daily. Eat ripe papaya at 10 p.m. before sleeping. One will not get liver or spleen problem in entire life. Avoid hot, spicy and fatty diet. Take light and easily digestible food. Avoid rice, black gram, green gram, excess sour and non-vegetarian food. Make a fine powder dried Jambul seeds and mix ½ tsp in a cup of fresh Curd/Yoghurt to have it. This natural remedy works very quickly in the treatment of enlarged spleen problem. To make a radish pickle peel and cut into slices a big Onion then add pure Vinegar, salt, Black Peppers according to taste preserve. This Onion pickle is very useful for. Alternatively, drinking 10 ml. fresh and pure extracted juice of Onion is very effective. Boil 1 kg Bor Zizyphus (Ber) tree leaves in 3 kg water until reduced by 1 kg let it cool and store. Take daily 50 gm. This effective natural remedy will offer a relief from enlarged spleen problem quickly. Take Hibiscus tree roots powder and rock salt in equal proportion, add little water to consistency, grind them to paste and prepare pea nut size balls, dry and store. Take one pill along with water before meal two times a day for 4 weeks. Stomach problems and spleen enlargement problems are subsides. Wash small bitter gourd, cut it into pieces, dry, and make powder, sieve and store. Mix 2 gm bitter gourd powder and 1 gm black pepper powder with 2 tsp honey take early in the morning. Enlargement of spleen problem is eliminated. Alternatively, Mix 25 gm Bitter gourd juice in cup of purified water and drinks it thrice a day. Drinking White goose foot/Pigweed decoction for 15 days is very beneficial in the treatment of enlarged spleen problem and it provides immediate relief. Boil 20 gm Drumstick tree bark (Sohanjana) in ½ litre water till it becomes ¼ litre, filter and add 1 gm Wild leadwort roots (sheetraj hindi) powder, 2 gm Long pepper powder (Pippali) 3 gm rock salt. Drink this mixture daily and enlargement of spleen problem will be resolved completely. Cut pieces of Fish poison/Wild indigo (Sarphukaa) plant, dry them and make powder and store. Take ¼ spoon powder with 1 cup cow’s curd two times a day for 3 weeks. Enlargement of spleen problem subsides. Take liquid food only while the above treatment is in progress. Take same quantity and dry roast dried ginger, long pepper, black pepper and make fine powders. Mix equal parts of burnt Prickly flower powder, rock salt powder. Mix all the above ingredients and store. Take 2 gm powder mix with 1 teaspoon honey daily. It is the most effective natural remedy for chronic enlarged spleen problem. Add little water to consistency to Wild leadwort roots (sheetraj hindi) powder, grind it and make small pills of pea nut size, dry them and store. Place one pill in the middle portion of a Banana piece and swallow it. Do this for 3 days. This effective natural remedy will offer a relief from enlarged spleen problem within 3 days. Extract 2 tbs juice from Drumstick tree (Sohanjana) root and mix milk in same quantity to drink. The Drumstick beans and flowers are popularly used as a vegetable and are most effective in treating enlarged spleen problem. Where does one find hibiscus root powder? have you found the hibiscus tree root powder yet? cause I can not find it anywhere.